Five candidates are running for Missouri Governor, including an Independent, Libertarian and green party candidate. Democratic Attorney General Chris Koster and Republican and former Navy SEAL Eric Greitens are also running. Independent Lester Turilli Jr. says Missouri should expand Medicaid. The Green Party’s Don Fitz wants Medicare for all, not just for those over 65. “By removing the insurance companies and having Medicare for all, we will actually lower health costs while providing more healthcare. Let’s remember that 90% of Missouri families are only one health disaster away from poverty. Expanding Medicaid and creating Medicare for all will solve that,” says Fitz. Libertarian Cisse Spragins says Missouri needs a free market in medical care. “We need to eliminate the problem where businesses can’t buy insurance across state lines. We need to deregulate healthcare. We need to remove licensing requirements to allow more people to practice medical care, especially consumers to choose medical care that’s their choice, not what the government has decided constitutes medical care. We all know Obamacare is a disaster. You just have to look at your health insurance premiums,” says Spragins. Spragins opposes “Right to Work” legislation that she says would prohibit employers from charging union dues to employees that have a union. 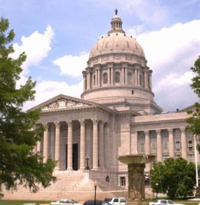 Turilli says Right to Work legislation would divide Missouri. Recent polling shows Koster ahead of Greitens by about 16 points. Due to term limits, Governor Jay Nixon (D) is serving his final year of his eight years.